Rebounds in lenders, miners and energy producers pushed European stocks to their biggest gains in three weeks. Commerzbank AG jumped 18 percent, the most since 2009, after saying it returned to profit. That eased concerns that the region’s lenders will fail to find a way to remain profitable in a low-rate environment, which sent them to their biggest plunge since August 2011 on Thursday. Deutsche Bank AG climbed 12 percent after saying it will buy back about $5.4 billion of bonds. Energy producers posted their biggest surge since 2008 and miners their biggest since 2009 as commodities rallied. 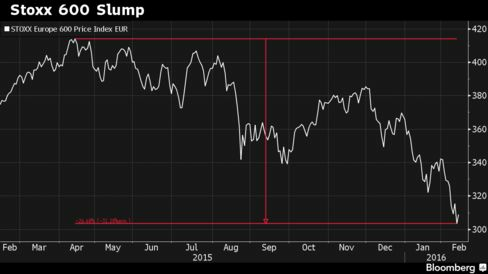 The Stoxx Europe 600 Index rose 2.9 percent, rebounding from its lowest level since 2013. Data showing that the region’s recovery kept its momentum also helped sentiment: Germany led the euro area’s growth to 0.3 percent in the fourth quarter, matching economists’ forecasts. With Friday’s rally, the benchmark equity gauge pared its weekly drop to 4.1 percent, with the volume of shares changing hands about a fifth greater than the 30-day average. A gauge of stock volatility for the region fell 6.8 percent after reaching its highest level since August. The Stoxx 600 closed 25 percent below its April record, taking its valuation to 13.9 times estimated earnings from more than 17 at its peak. European equities have been among the most hurt during the rout that erased about $8.6 trillion from stocks worldwide this year alone. Among 93 global equity gauges tracked by Bloomberg, four of the 10 worst performing were from Europe, with Germany’s DAX Index down 17 percent in 2016 and Italy’s FTSE MIB Index falling 23 percent. With a 25 percent plunge this year, Stoxx 600 banks have suffered the most amid growing concerns over the impact of low rates, bad loans at Italian lenders and Deutsche Bank’s ability to repay debt obligations. Credit Suisse Group AG joined the German lender and counterparts in Greece and Italy in trading at or near record lows on Thursday, while Britain’s Standard Chartered Plc tumbled to its lowest price since 1998. The group rebounded 5.6 percent on Friday, the most since 2012, with all three firms rising more than 6 percent. Italy’s Banca Monte dei Paschi di Siena SpA was one of the few to fall, extending its record low by 5.2 percent, after MSCI Inc. removed it from its index of Italian shares. Among other stocks moving on corporate news, L’Oreal SA added 2.4 percent after sales growth at the world’s largest cosmetics maker beat projections. Rolls-Royce Holdings Plc rallied 14 percent as its restructuring efforts enabled it to maintain its earnings projection despite a dividend cut. Danish medial-equipment maker GN Store Nord A/S jumped 9.1 percent after forecasting rising profit this year. UbiSoft Entertainment SA was among the few companies that fell. It declined 9.1 percent after the video-game maker cut its full-year sales and profit forecasts. For example COMD could have technical rebound. For example COMB could have technical rebound.